With many favorite subjects of continued fascination, I have always been thrilled by the Apollo lunar missions. This is, of course, due partly to my interest in space & astronomy, yet also an extension of my love of nature, "... with the hiking and the biking and the whoa ! .. thank you, mister science-explorer-type-person ... ! " Just imagine waking up and looking out at your camping spot, only to suddenly recall that you've just risen after a good night's sleep on the Moon ! For this and many other reasons, the "J-missions" of Apollo 15, 16, & 17 are to me the most fantastic. During each of those visits, 2 astronauts camped on the Moon for three days, and drove their lunar rover around to many amazing locations, studying the geology and taking thousands of photos, witnessing some of the most incredible vistas yet seen by human eyes, while going about their day's work, in a vacuum. The picture that I've been using as the cover photo for my Apollo tribute project, "Welcome to the Moon", features Apollo 17's Jack Schmitt at geology Station 1 during their first EVA. ( photo : AS17-134-20425 ) ... see Apollo Lunar Surface Journal for more info ! 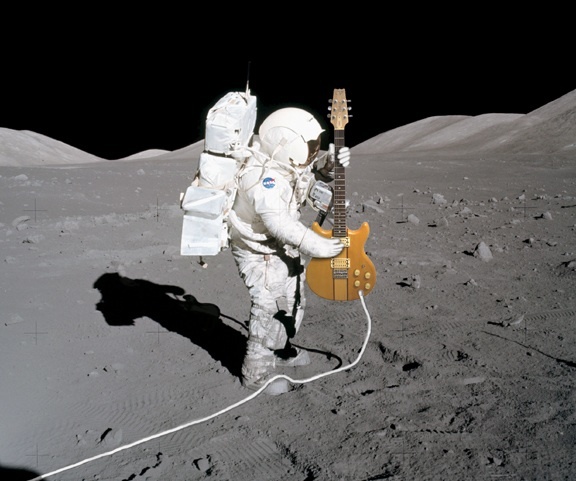 I have always hoped that he'd excuse my replacing his lunar rake with my Vantage electric guitar ! Many of his humourous and personable quotes have found their way into my tribute video series. With a good assortment of talented progressive-rock heroes that inspire me, it seems only natural that I should go on a bit about composer & keyboardist extraordinaire, Keith Emerson. 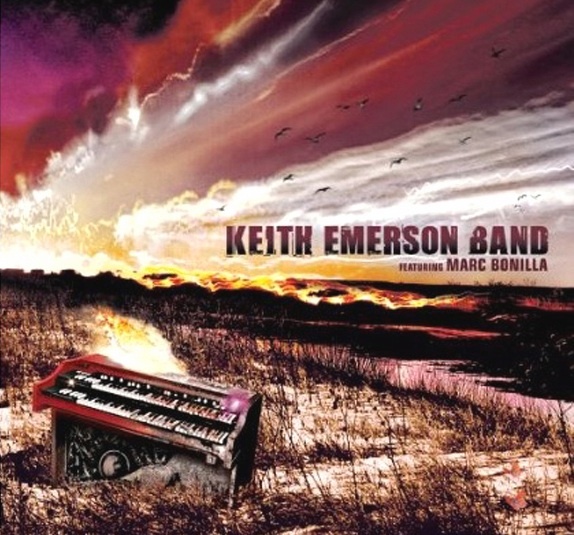 And in other blog posts, I'll surely mention ELP - Emerson, Lake, & Palmer, but here I'd like to feature an amazing recent album by the Keith Emerson Band, with guitarist / vocalist Marc Bonilla. After years of continued growth and evolution, Emerson has been able to put out a prog album of impeccable musical richness - full of melodic, chordal, and rhythmic diversity. The songs are accessably catchy AND deliciously complex ! The collaboration with Marc Bonilla has turned out to be an inspired match. And so many of the quintessential Keith Emerson flavours are there throughout the project... almost as if Bonilla said, "now do all that Emerson stuff that you do ..."
Great playing by all the musicians there ... and I have to say that my hands-down favourite piece is the undeniable f@#%ing tiger of a song, "The Art of Falling Down" !!! Dangerously cool rhythmic changes and a gritty bluesy feel to make even rockin' Led Zepplin fans yell, ohhh yeahhh !! Look for the CD and the concert DVD "Live in Moscow" online .... at Amazon, etc. Enjoy Keith Emerson music ! .. . . . . . . . Pass It On !! The powerfully attractive "fake-lunar-landings" myth has become increasingly popular, especially among people who will probably never bother to read the fabulous & definitive Andrew Chaikin book, "A Man on the Moon", or spend time investigating the extensive website "Apollo Lunar Surface Journal", or view hundreds of hours of mission footage DVD's from "Spacecraft Films" ... getting to know a little better some of the people who made Project Apollo a reality. Some folks remain skeptical about the successful manned space missions of the 1960's and '70's, given that most modern-day government agencies now exhibit such extreme inefficiency, corruption, and wastefulness. 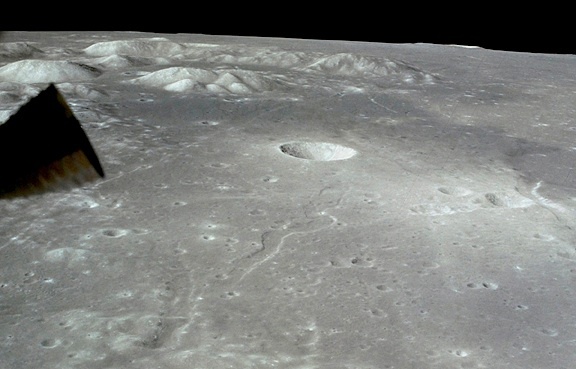 The ColdWar and SpaceRace did provide a unique set of circumstances for the pursuits of space exploration, and the obvious target of the only close destination in the neighborhood, the Moon. And while I probably need not concern myself with what various skeptics choose to believe, it does seem a shame that they would deny themselves the enjoyment of some of the most awesome and amazing journeys ever taken by human beings. 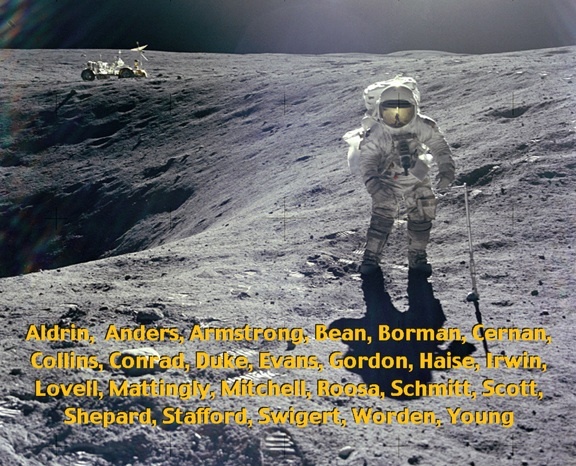 For an entertaining glimpse into the lunar adventure, I have assembled the tribute project, "Welcome to the Moon", a collection of audio-visual clips from the Apollo missions, with original progressive-rock music soundtracks. Here is another very favorite shot - a view out the window during Apollo 15's pass over the Sea of Serenity. The original picture ( photo: AS15-87-11709 ) can be viewed at the "Apollo Lunar Surface Journal" site. I have turned and cropped the image, to highlight the incredible landscape which the astronauts saw below them.